Research has shown that prenatal yoga has a ton of benefits: reduces physical discomforts; improves quality of life and interpersonal relationships; lowers stress, anxiety and associated health problems; decreases length of labor; and improves birth outcomes. A well-trained, experienced prenatal yoga teacher is the key to unlocking these benefits. Hillary Easom and Jeanna Lurie are two of the most experienced prenatal yoga teachers in Silicon Valley, with thousands of hours of teaching and training in their backgrounds. 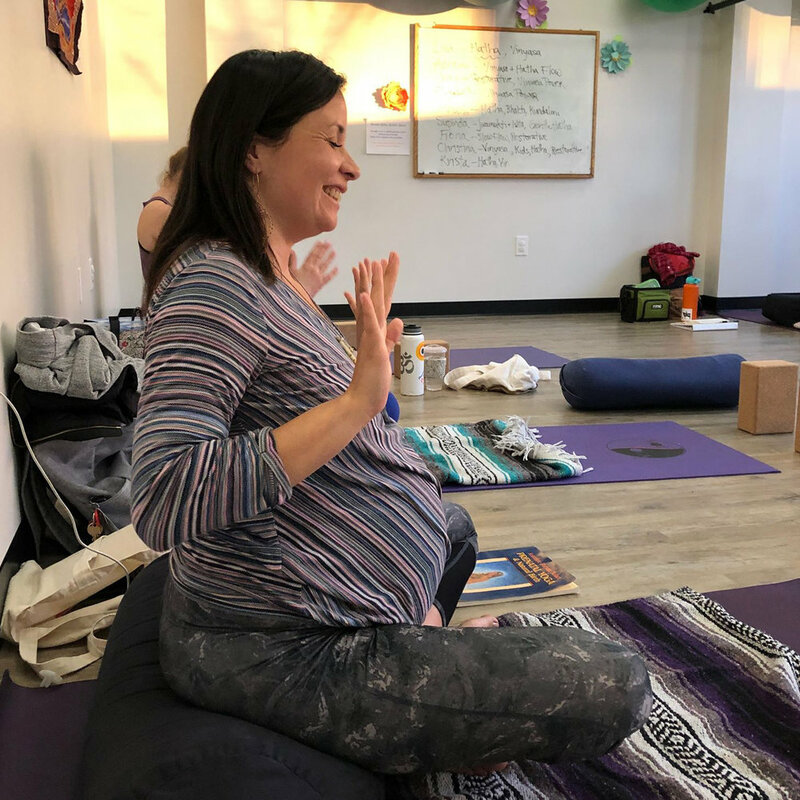 They create a warm, safe space where pregnancy discomforts and questions regarding pregnancy, birth, and postpartum are addressed through conversation and key elements of a well-rounded yoga practice. A typical class begins with a brief check-in, continues with meditation, posture practice (including exercises for core/pelvic floor stability), and ends with a relaxing restorative pose. Discussion regarding staying comfortable and healthy through pregnancy and preparing for labor and parenting is woven through the practice. This format allows you to build deep relationships with other mothers-to-be, nurture yourself through your pregnancy, and identify and plan for what is important to you in your birth experience. Many mothers express that prenatal yoga was the single most effective way of preparing for birth. All levels of yoga practitioners are welcome. Experienced yogis will be given options to deepen their practice and benefit from the attention to pregnancy that is not available in their regular classes. Beginners will enjoy the slow pace enabling them to learn the art and science of yoga to not only benefit their experience of pregnancy and birth, but to start a lifelong practice if they choose. Leave class feeling feel refreshed, renewed, and empowered on your motherhood journey becoming a mother!